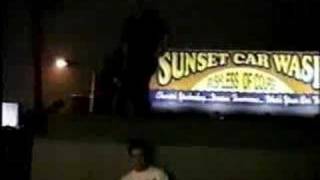 The Sunset Car wash features a steep bank that has seen a lot of action over the years. From Gonz's meat-grinding slam to Greco's backside ollie (and subsequent Transworld cover), the Car Wash has featured some serious stuntage from a brave few, but most who visit opt out of craze like that. The banks are steep (see photo below) but definitely worth a trip, if only to pay homage to this legendary LA Skatespot.